Crystal Water Varnish is a medium that increases the gloss and brilliance of watercolor. Apply over dried watercolor or mix with color prior to painting. The gloss decreases when diluted with water. Retards drying and remains water soluble. 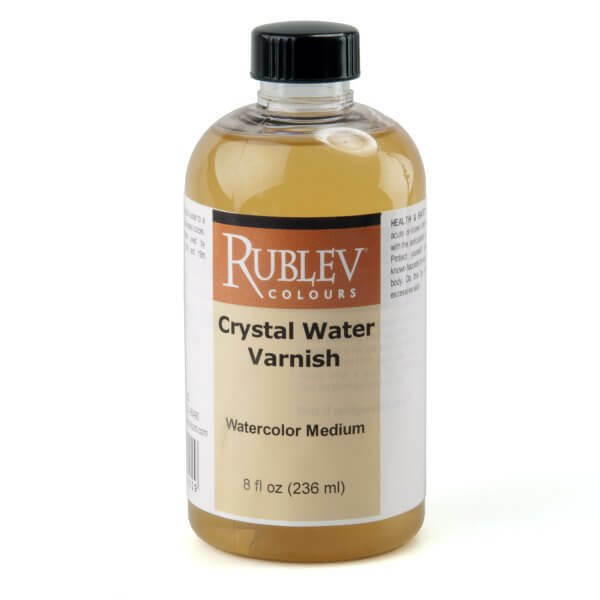 Crystal Water Varnish is a gum arabic varnish that adds luster to a watercolor painting and saturates colors. It adds gloss to the surface of watercolor paintings and allows glazing of watercolors without lifting the paint underneath. Use it over darker colors to increase color depth and saturation. It is based on recipes used by watercolorists of the 18th and 19th centuries. Clean brushes with warm water. To ensure desired results, always make a test piece for your particular application and surface. Watercolor Paintings: Allow to dry thoroughly (typically overnight, but sometimes 1-2 days, depending on the local humidity). Apply a thin coat, so as not to disturb the underlying paint layer, with a soft-hair brush. Allow to dry before applying another coat. Drying time may be delayed in humid or cold environments. Can be thinned with water.